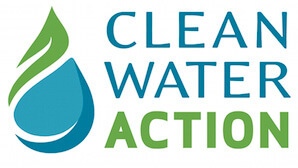 Clean Water Action is pleased to announce its endorsement of US Congressman Jim Langevin for Rhode Island’s Second Congressional District seat in the general election on Tuesday, November 8th. 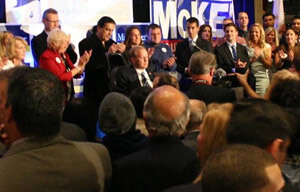 Since his election in 2000, Congressman Langevin has worked to represent Rhode Island’s environmental concerns and priorities at the national level. He has championed the implementation of a comprehensive marine management plan for the waters of the northeast, led the effort to extend tax credits that encourage the development of new renewable energy projects, and has consistently supported funding measures for the study and protection of Rhode Island’s estuaries and coastal resources. In addition, he received a score of 100% on Clean Water Action’s 2013-2014 National Legislative Scorecard for his opposition to efforts to undermine the Clean Water Act, roll back safeguards for public health, and weaken carbon emissions regulations. The newly repainted arch at Rocky Point in Warwick was unveiled in a public ceremony Monday, with speeches by public officials that sparked memories of the long-gone amusement park. 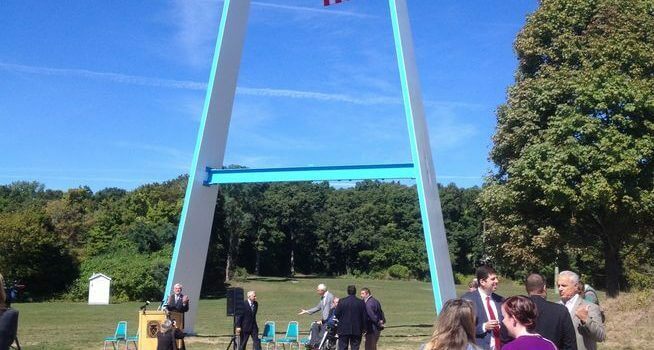 The arch, one of 11 displayed at the New York City World’s Fair of 1964-65 made its way to Warwick by unknown means, said Mayor Scott Avedisian. “The arch, originally created by General Mills, the cereal company, was one of 11 originals that represented peace through understanding, and stood as markers during New York’s World’s Fair,” said Avedisian. Long rusted and unused during the years that Rocky Point stood abandoned, the arch was repainted by a city employee. The cost was covered by more than $5,000 in grant money from the Rhode Island Foundation, in a project overseen by the non-profit Rocky Point Foundation, headed by newspaper publisher John Howell. “The arch really fit very well at the time with an amusement park, and here it comes sort of full circle, and now is representing not only a place, hopefully of peace, but a bright future … for future generations to enjoy this place,” Howell said. The House passed H.R. 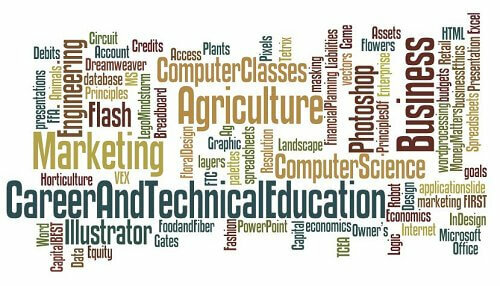 5587, the Strengthening Career and Technical Education for the 21st Century Act, a bill championed by Congressman Jim Langevin (D-RI) and Congressman Glenn ‘GT’ Thompson (R-PA), co-chairs of the bipartisan Congressional Career and Technical Education (CTE) Caucus, and Congresswoman Katherine Clark (D-MA). Langevin is an original cosponsor of the bill, which reauthorizes and modernizes the Carl D. Perkins Vocational and Technical Education Act. The Strengthening Career and Technical Education for the 21st Century Act is the first reauthorization of the Carl D. Perkins CTE Act since the bill expired in 2012. It better connects classrooms with workforce trends and encourages strong partnerships between educators, employers, and community partners, ensuring opportunities for underserved students, in particular. The legislation also promotes the implementation of innovative CTE programs, improving outcomes through an increased focus on employability skills, work-based learning opportunities, and meaningful credentialing that would make students more competitive. Additionally, the bill includes components of Langevin’s Counseling for Career Choice Act and provides stronger supports so that professional school counselors can appropriately advise young people on all of the options available to them. Prior to House passage, the Strengthening Career and Technical Education for the 21st Century Act passed unanimously out of the Committee on Education and the Workforce. Langevin thanked Clark for her stewardship of the bill in committee, and thanked Chairman John Kline (R-MN) and Ranking Member Bobby Scott (D-VA) for their commitment to shepherding the bill to the House Floor. Congressman Jim Langevin (D-RI), who serves as Energy Task Force Chair on the Sustainable Energy and Environment Coalition (SEEC) in Congress, today introduced the Offshore Wind Incentives for New Development Act. The bill, also known as the Offshore WIND Act, is a House companion to legislation introduced by Senators Sheldon Whitehouse (D-RI) and Ed Markey (D-MA). “Clean energy is the future, without question, and we need to clear as many hurdles as possible to ensure that we are investing and innovating in cleaner, more efficient and more sustainable energy solutions. Wind power is an important piece of that puzzle, and the Offshore WIND Act would help incentivize additional offshore wind projects,” said Langevin. Tax extenders approved in 2015 included wind and solar tax credits, but the timeline provided for offshore wind was not sufficient. Under current law, the Investment Tax Credit (ITC) for offshore wind will expire in just three years. Due to the extensive siting and construction process of building offshore wind farms, however, the Department of Energy has found it unlikely that any additional projects would qualify before the current credit expires in 2019. I am honored and incredibly grateful to the Democratic voters of the Second District for their support. I cannot thank them enough. It’s their support that keeps me going and their experiences that inspire me to continue my journey in public service. I have long said that I do not see my position as a birthright – I am merely a steward of a seat that belongs to the people of Rhode Island, and I will keep working hard every single day to represent Rhode Islanders to the very best of my ability. I also want to thank my primary opponents, John Hamilton and Steve Archer. I am encouraged to see more people interested in getting involved in our democracy, and I congratulate them on their respective campaigns. I am more passionate and enthusiastic about serving Rhode Island than ever before, and this victory will reinvigorate me as I work hard for every vote in the General Election. I take nothing for granted, and I will be campaigning vigorously over the next 56 days. I look forward to knocking on doors and meeting with more voters in the weeks to come to lay out my accomplishments and share my hopes for a brighter future for our state and our nation. EAST GREENWICH- The local fire department is the recipient of $88,191 in grants from the Federal Emergency Management Agency’s Assistance to Firefighters Grant Program, money that will allow the department to purchase new safety equipment. The grant is a portion of $160,000 in federal funding that is being dispersed to both the East Greenwich Fire Department and Portsmouth Fire Department as part of the Assistance to Firefighters Grant Program. In East Greenwich, the fire department will use the funds to purchase a rapid escape system for each member of the department. The rapid escape systems will allow firefighters to safely descend from burning buildings and help rescue residents inside, by giving firefighters a tool that can anchor to another structure and allow them to escape from a high point on a building. In addition, the EG Fire Department will purchase several pairs of turnout pants that will be fitted with the appropriate gear to support the escape systems. In Portsmouth the fire department will use their $71,896 grant to create a Rapid Intervention Team training program, a team that is dedicated solely to search and rescue of seriously injured firefighters. The two grants add to the total of over $2.5 million in AFG funding in 2016 to help 13 fire departments throughout Rhode Island. Since 2001, Rhode Island fire departments and other first responders across the state successfully secure over $27.3 million in AFG grants to pay for equipment upgrades, protective gear, emergency vehicles, training, and other resources. HOPKINTON — The Hopkinton Democratic Town Committee has endorsed U.S. Rep. James Langevin, D-2nd District, in his bid for re-election. “Jim shares our priorities, as well as our hopes for a stronger Rhode Island, a more equal nation, and a more peaceful world,” said committee Chairwoman Gloria Rhodes. “We’re proud to have him by our side as we all work together for the good of our state.” Langevin was elected to his first term in 2000, and currently serves as a senior member of the House Armed Services and Homeland Security committees. “I am as focused and enthusiastic as ever about serving the people of Rhode Island, and it means so much to have people like Chairwoman Rhodes and the Hopkinton committee members supporting me in my efforts,” Langevin said. Join Jim Langevin for coffee and a candid conversation on Monday, October 17, at 12 p.m. This is one in a series of #LangevinListens coffee hours, and all contituents are invited to join Jim to ask questions, share your concerns, and talk about the issues that are important to Rhode Island. Let us know if you can join us by clicking here.